Mabu is a friendly, in-home robot companion for people with heart problems. She supports, educates and monitors patients with cardiac conditions, helping reinforce healthy lifestyle habits, such as AHA’s Life’s Simple 7 and helping the patient take their medications correctly, and make timely decisions when they have symptoms or concerns. Mabu can provide in-home patient education and reminders, both on a scheduled basis and when the patient wants to learn, using conversations and knowledge checks with data transmission to the clinician. Mabu can also be used to streamline communication between the patient and their clinician, leaving more time for what really matters. You will be interviewed shortly for feedback on how Mabu can help Cardiac Rehabilitation Program staff, physicians and patients. We need your recommendations about how Mabu can help Cardiac Rehabilitation Program staff, physicians and patients. If you are willing to help, one or more representatives from VenAdvisory will interview you, asking questions about how Mabu might be used for cardiac rehabilitation. This information will help us understand what Mabu should be able to say and do, and how Mabu would be used in the context of cardiac rehabilitation to support both patients and clinicians. Mabu – What is she? 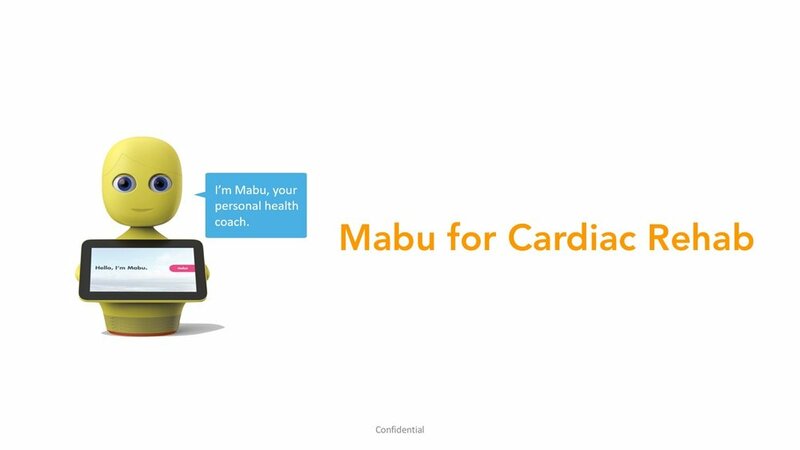 Mabu is a robot, designed to be an attentive, connected health coach and companion for patients with health problems. She is in the patient’s home, providing 24/7 support to complement the efforts of busy nurses, physicians and family caregivers by filling critical gaps between clinic visits or phone calls. 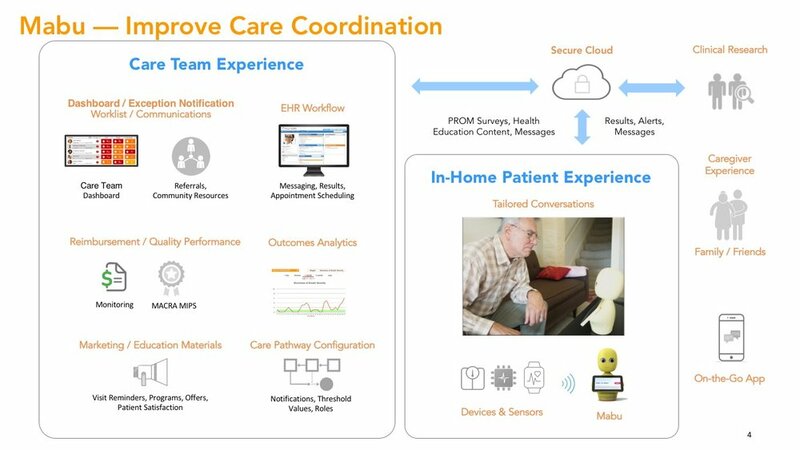 Mabu also supports the care team with a nurse dashboard, and she can also go mobile keeping caregivers and family members up-to-date. 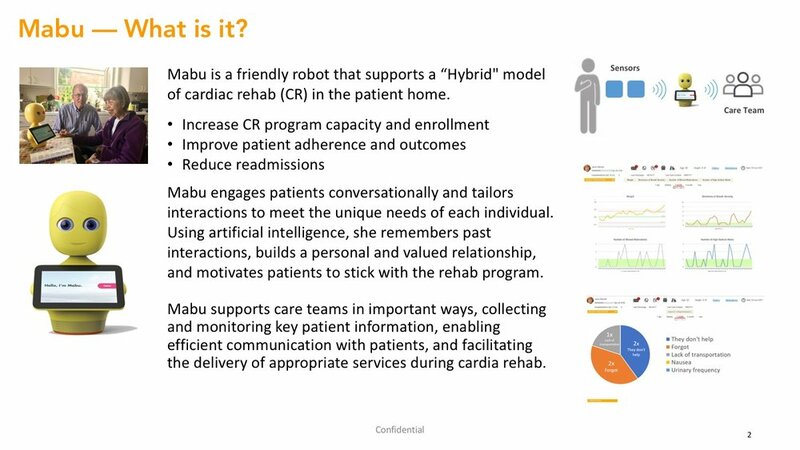 Heart failure has been the first focus in developing Mabu’s readiness to support cardiac patients, and pilots are underway to develop and test Mabu’s ability to support patients in the home, promote positive patient outcomes and reduce readmission. Now, we are expanding to cardiac rehab, knowing that engaging in physical activity and a healthy lifestyle involves many decisions every day. This will also take advantage of Mabu’s ability to connect with wearable devices and smartphones that allow patients to record their own objective outcome data about their performance as well as their health. Collect accurate patient-reported data on a daily basis about diet, exercise, medication adherence and other health behaviors. Identify barriers to healthy lifestyle choices, exercise and medication adherence to personalize the individual patient’s cardiac rehabilitation plan. Promote enhanced patient engagement, accountability and accurate reporting of patient outcomes. Promote enrollment in traditional Cardiac Rehab programs with hybrid home-based, on-the-go and virtual Cardiac Rehab options. Reinforce healthy behaviors to modify cardiac risk factors between Cardiac Rehab visits. Healthy eating, counseling, exercise, weight, medication adherence, tobacco cessation. Reinforce key care plan activities and Cardiac Rehab goals with reminders, educational information and conversations to confirm understanding. Reduce Cardiac Rehab visit no-shows, attrition, wait lists, patient out-of-pocket costs and other barriers to participation. Enhance the frequency and accuracy of patient reporting of psychosocial and health outcome data. Support a protocol-driven, nurse-managed approach to Cardiac Rehab delivery for low-to-moderate risk patients in the home or on the go. Promote access to Cardiac Rehab for patients who may be unable to attend facility-based Cardiac Rehab due to challenges with cost, transportation, driving time or other barriers. Increase revenue for Cardiac Rehab service lines. Scale up Cardiac Rehab program services for more patients without impacting staff caseloads. Support clinical trials of innovative Cardiac Rehab solutions. PLEASE CLICK ON THE FIRST IMAGE BELOW AND REVIEW THIS PRESENTATION BEFORE YOUR INTERVIEW. Your time will be put to a good cause. At your election, VenAdvisory will donate honorariums made to any one of the following charities. Participants will receive a receipt from the cause as confirmation of your donation. Thank you for making a difference! The overwhelming consensus is to donate to the Redwood Credit Union. It is a very popular, well-respected local credit union. 100% of the donations go to victims of the fire and relief efforts. The Houston Food Bank has a history of providing disaster relief and will provide food and supplies in the short term and for many months to come to residents in southeast Texas who will struggle to rebuild their lives. The Food Bank will work closely with our network of partner agencies to ensure food is getting to those who need it most. The Food Bank also finds ways to connect offers of help with those who are providing help.